Nightmare on Mare Street, as East London residents witnessed a “man on fire.” He is currently fighting for his life after a “huge” explosion. 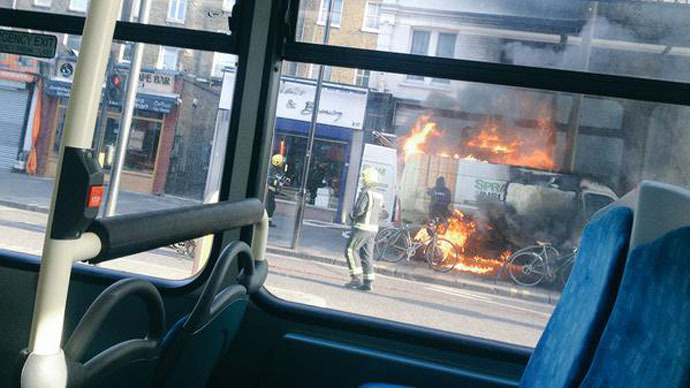 After the van caught fire, just after midday on Sunday, the flames rapidly spread to a nearby shop in Mare Street, Hackney. The blaze was brought under control after just over an hour. Four fire engines and nearly 20 firefighters were at the scene. What is going on? Heard a massive blast and now there's shops on fire on #marestreet#hackney#london ??! The incident was “not terrorist-related,” the Metropolitan Police confirmed. “The van and a property are believed to have set fire [sic] as a result of works carried out near a generator inside a commercial property at around 12.15,” a police spokesperson added. There were no other reported injuries. Adjoining streets remain closed.